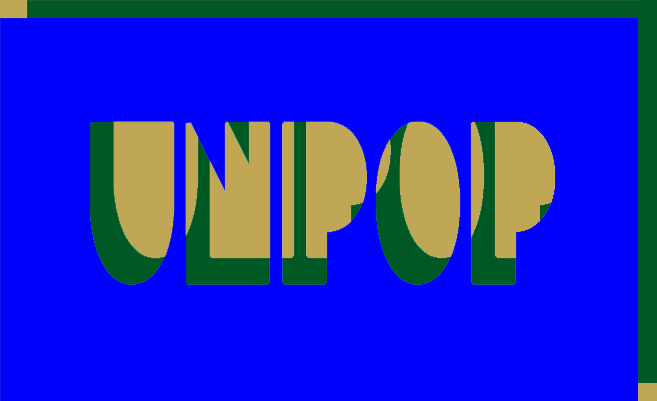 UNPOP, or "Unpopular Music," is an intimate, 8-channel listening environment. It features exquisite, detailed sound works, including field recordings, abstract electroacoustic music, ambient textures, and other non-beat-oriented sonic experiences. Encompassing a circular space 40 feet in diameter, the piece is built around a circle of small custom-built Hemisphere speakers by Isobel Audio, which enclose a listening area complete with soft couches for comfortable seating. We have created multiple long programs of sound works that run from dust until dawn (6:30pm to 7:00am), which includes our own works, as well as curated pieces by nearly 40 composers and sound artists. 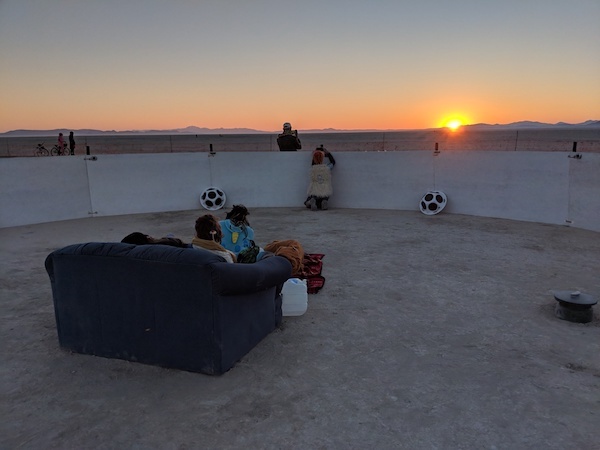 UNPOP is designed with the deep playa environment at Burning Man in mind, as well as the audience that is likely to encounter this listening sanctuary there. In 2018, UNPOP was located at 12:15 and 7400' (at the trash fence). 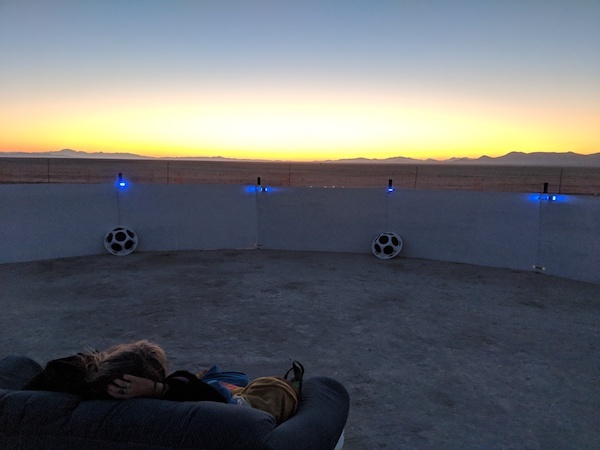 As sound artists and long time burners, we have taken a special interest in the soundscape of Burning Man and the impact it has on its inhabitants: the city's overall sonic structure, the music camps from close and far away, the happy and bewildered people, and the many artworks that include sound. We have noted the diversity of artistically crafted sounds available at Burning Man, but it remains true that the majority of sounds heard in the city come from beat-oriented music of various kinds. We love this! But at the same time, we have often longed to find alternative sonic experiences. 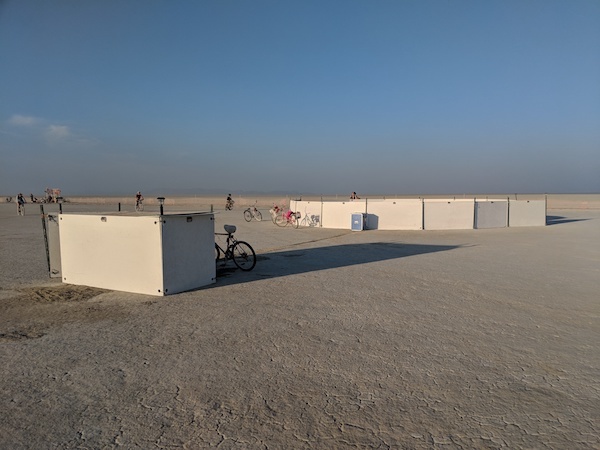 Each year, we find ourselves spending much time roaming in the deep playa, where the unintended, aggregate soundscape of the city is at its most interesting. 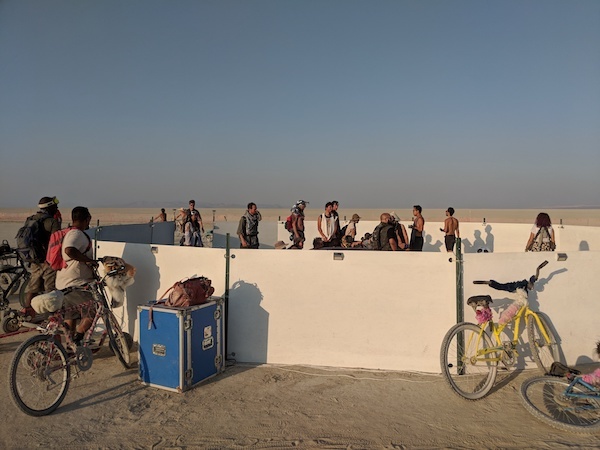 At night, the rumbling beats of the city come rolling across the playa and become textural, ebbing and flowing, and intermingling with soft local sounds: bicycles, people laughing softly, the wind, and sometimes ghosts, it seems. With over 20 years of playa experience between us, dating back to 2003, we are glad to finally be realizing a dream we have long envisioned. We believe UNPOP will resonate with this special environment, particularly with our fellow deep playa wanderers. Julie Smallwood, for helping us get the two amazing couches (pictured above) from the BV ReStore! 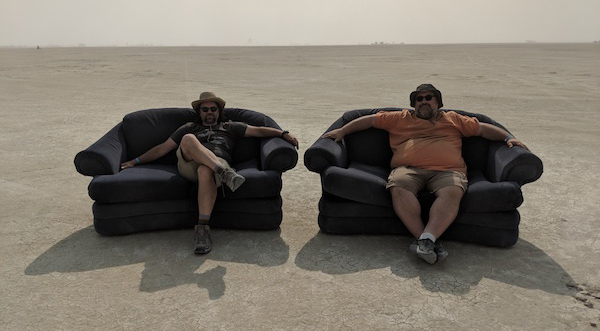 Burning Man's Art Placement Team, for giving us an awesome spot on the playa in 2018! Every artist who contributed their amazing work, and for all of the careful instructions and enthusiasm we received from them. Love it when people give a damn!